“Jojo” was born in Casablanca, Morocco in 1958. Exposed to an artistic environment at an early age. JoJo’s father and brother both reached high achievements in the mediums of painting and sculpturing. Although having deep roots in art, Jojo began his career as a farmer, with the desire focus on a profession in which he could provide for his family. After roughly twenty years as a farmer, Jojo was able to follow his true passion for creating art. Jojo incorporated farming machines and techniques he was already skilled in, into his work, which led to the discovery of several artistic methods including his use of water pressure to manipulate metal into various forms of artwork, and furniture. Jojo’s art is diverse and includes murals characterized by clean and elegant lines, spontaneous paintings created by abstract compositions, unique metal chairs and armchairs, a variety of vases, and other surprising works that are constantly renewed. His pieces are exhibited in dozens of galleries across the world with items being sold to buyers in Israel, the United States, Europe, Australia, China, and more. 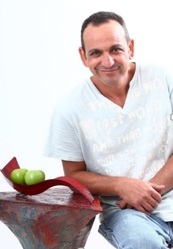 Jojo opened his first gallery 10 years ago in Tel Aviv, Israel. After much success and a growing global following, he opened his New York Gallery in the Soho neighborhood in June 2017. I find my ability to express simplicity and the beauty of being naïve, but still appreciated and enjoyable by other people, is a big success to me. My art is straightforward, cheerful and soulful, I think that the fact that many people like it and relate to it is one my biggest success. My intention is to make people feel happy and good while they are expiring the art. The most important characteristic I have is curiosity. I’m always experimenting and looking for new techniques, inspirations and expressions. My brain is constantly thinking about new art discoveries, and I’m fascinated and inspired by many things. For example, I discovered that water pressure can manipulate metal. Then I started studying this technique and now I create furniture using it. Another example is the painting method I use. Once I realized I’m able to create fast pace “action painting” using water bottles, I started creating figures with the new painting technique. Therefore my art is very rich and diverse. I’m dealing and creating with many different mediums and materials (metal, acrylic, ceramic, canvas, water pressure, welding and more). My aspirations is to prove that my simple naïve language has its place in our sophisticated high tech world. My purpose is to make joyful art and reach people hearts. Art should be a source of beauty and joy for everybody! For me art is an expression of happiness and joy and the celebration of life. Marrying my wife! She is my support and my sanity. Another big success related to my art, was selling my first painting. I use to be a farmer and only around the age of 40 years old I felt it’s the right time, after my kids a bit older. I didn’t want to be typical “tortured artist”, therefore I started late and I’m still happy today whenever a person is festinated by my art. I used to be a framer and then I started manufacturing the sorting machines for the vegetables. Through my experience with metal I discovered I was able to manipulate metal with water pressure. This technique was discovered following a malfunction in a metal container that was used for agricultural purposes. The container was distorted as a result of an excessive water flow. This malfunction transformed into a discovery – a unique idea for furniture-making, characterized by intriguing shapes. My “Yong Iron Arm Chair” is the first of its kind; it is surprisingly comfortable thanks to its curves, created by the water-pressure. Beauty and happiness are found in the simplest forms around us. • Picasso- his rich diverse art over the years, and mainly his human profile figure. • Andy Warhol- for his repetition of elements and the use of color. • Keith Haring – for the strong contour line. Where I live in the desert by the Dead Sea. The isolated village is a lively point in the middle of the Judaean Desert in Israel. The desert is a “blank canvas” for me to inject color and life into. I create in the serenity of the desert where I draw inspiration from a variety of origins, incorporating elements taken from my native Moroccan roots and combining them with more modern, Western features. The women figures in my painting are very important for me. The came out from my guts, for me the women figures represents strong power, creation and prosperity. When they are put together like in my paintings, they are a big inseparable tribe that determine the world and humanity rhythm and pace. My current passion is a development of new wall and standing sculpture which will be revealed soon. The gallery in Soho New York, is also an exciting new feature in my life, both om my children are at charge of this gallery, this was our family dream for many years.